The Federation Track wends its way from the Royal Exhibition Building through busy city streets past many of Melbourne’s finest old buildings through the cool shade of Fitzroy Gardens, past the Melbourne Cricket Ground and the National Tennis Centre and across the Yarra to the Kings Domain and Shrine of Remembrance- a monument to the tragedy of war. A stroll through the quiet oasis of Albert Park with its mirror-still lake brings you to St Kilda. The clear, blue water of Port Phillip Bay are usually alive with yachts, windsurfers and speedboats racing across the sparkling waves while on the beach there are people of all ages and sizes – cycling, jogging, walking, roller-blading, sun-baking, posing or just having a good time at the beach. The crowds diminish as you head south along the edge of the bay and soon soft, sandy footpaths wind their way through twisted Tea-trees and shady She-oaks. The cliff line starts to slowly rise and views across the bay appear. The high blue ranges of the You Yangs to the south-west and the imposing hummock of Arthurs Seat to the south grow larger on the horizon while Red Bluff and Half Moon Bay remind you of southern France. The long, golden beach from Mentone to Mordialloc is followed by the Long Beach Trail that runs past the remnant of the giant Carrum Carrum Swamp. At Carrum, the shaded Seaford Track winds through the coastal scrub behind the dunes to picturesque and leafy Kananook Creek that runs through the heart of Frankston. At its mouth a spectacular footbridge, boardwalk and promenade takes you to the base of Olivers Hill. 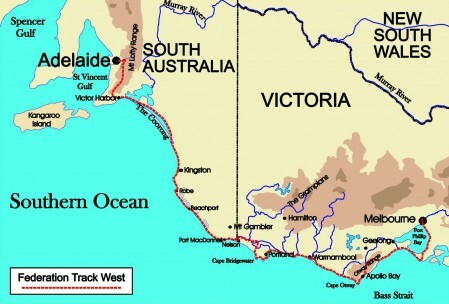 From here to Mornington the track runs along sandy beaches, across protected coves and over rocky platforms intermingled with short sharp climbs over headlands with excellent views up and down the coast. Beyond Mornington there are wonderful seascapes of the cliffs and coves of southern Port Phillip Bay with Balcombe Head and Arthurs Seat providing a majestic background. The route up Sunshine Creek to Mount Martha provides unexpected views of Schnapper Point and the last view of Melbourne’s skyscrapers. 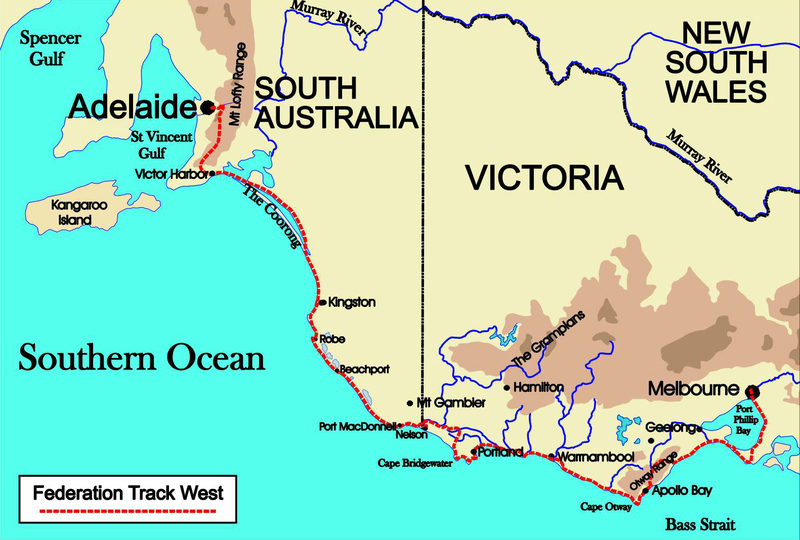 At Pebble Beach the Coast Path returns to Dromana where the Two Bays Track climbs up Arthurs Seat. The climb is surprisingly benign and the succession of wonderful panoramas of the Mornington Peninsula and Port Phillip Bay unforgettable. The descent from Arthurs Seat reveals the first pastoral and agricultural scenery while at Greens Bush the landscape changes to old growth forest. The last stretch to Cape Schanck is a marvel of contrasts. One minute you are walking past mobs of kangaroos grazing on grassy clearings; the next minute you are looking out on the golden beach of Bushrangers Bay with pounding surf, eroded basalt cliffs and the cry of seabirds on the wind. Along the Bass Strait coast, the dramatic basalt cliffs and churning seas of Cape Schanck and Selwyn Fault are followed by a long golden strand interspersed with limestone headlands and ledges. At “Number Sixteen” the track wanders past rock stacks and twisted limestone cliffs with a grey-green cap of coastal Banksia scrub that complements the golden strips of the sandy coves. The white foam of the surf fringes the golden-green waters that change abruptly to cobalt blue. Lookouts abound and birdlife is prolific! From Sorrento Ocean Beach to Sorrento Pier you make your way through the outskirts of the delightful seaside resort of Sorrento with its interesting mixture of limestone colonial mansions and modern beach cottages.